The companies adhere to the science and technology enterprise , pay attention to leading technology ,always adhere to the user’s interests first , the pursuit of reliable performance ,excellent quality , the first -class enterprise in the world , to implement customer satisfaction project ,at a reasonable price ,high quanlity products and perfect service for various industries carry tripods blockbuster. The company is committed to each big and medium -sized cities across the country set up sales and service companies and branches , established a strong sales and after-sales service system , thoroughly solved the trouble back at home of users , make the company’s products to further expand into new areas of customers hand in hand to create a win-win situation in the future. 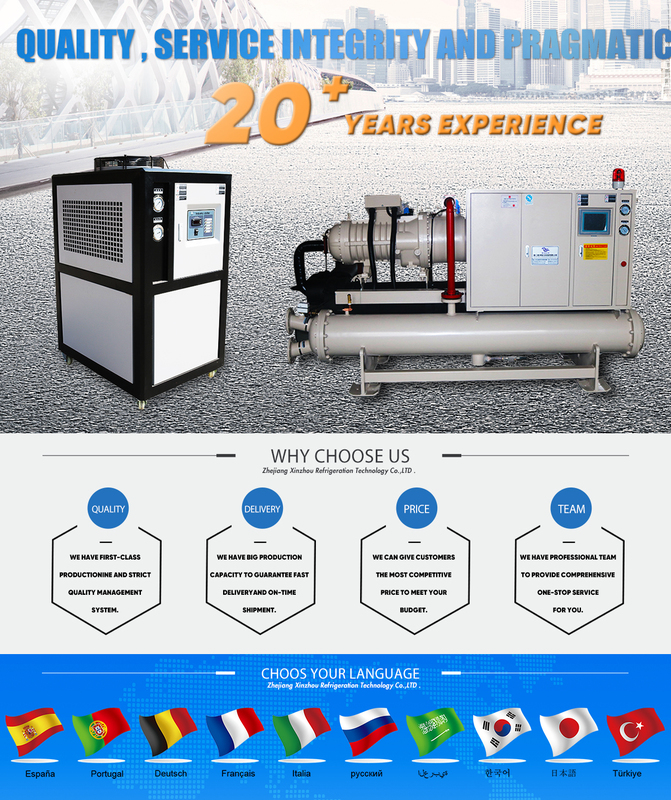 We are a professional refrigeration equipment manufacturer with almost 20 years' experience, we have ability to develop high-tech products and we have strong hardware facilities.Our products are in high quality. 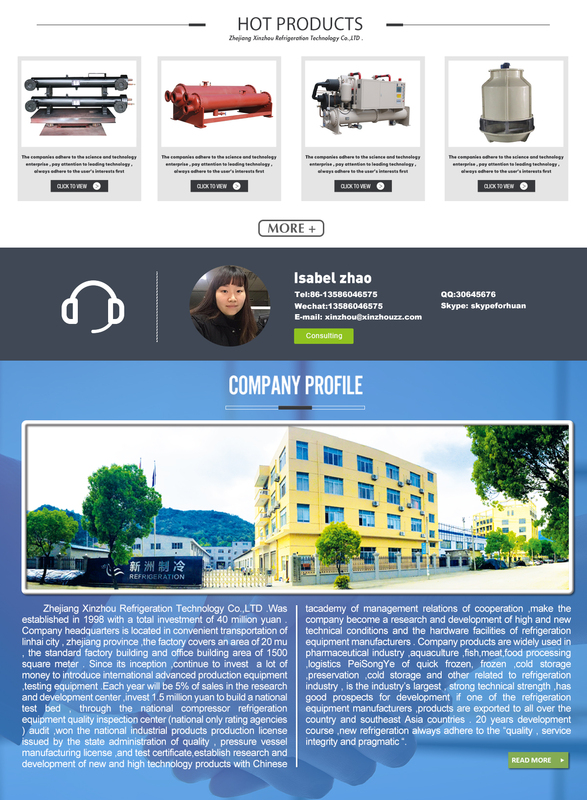 Zhejiang Xinzhou refrigeration technology co.,LTD. was established in 1998 with a total investment of 40 million Yuan. Company headquarters is located in Linhai city, Zhejiang province. The factory covers an area of 20 mu and the standard factory building and office building cover an area of 15000 square meters. Each year, the company will put 5% of sales into research and development center, invest 1.5 million yuan to build a national test bed. Through the national compressor refrigeration equipment quality inspection center( the national only rating agency), the company had won the national industrial production license issued by the state administration of quality, pressure vessel manufacturing license and test qualified certification. Xinzhou has established a cooperation relationship with Chinese Management and Science Academy in researching and developing high-tech products. Company products are widely used in pharmaceutical industry, aquaculture, fish, meat, food proceeding, quick-frozen, cold storage preservation and other related to refrigeration industry. Xinzhou is one of the largest scale, the most abundant technical strength , and the best development prospects companies in the same industry. Company products are exported to all over the country and southeast Asia countries. In the past 18 years' development, Xinzhou always adhere to the "quality, service, honesty and pragmatic" principles. Xinzhou is very strict in quality and insist on producing high quality products. Xinzhou is trying to develop itself to be a strong core competitiveness of high-tech refrigeration equipment manufacturers, and Xinzhou would be glad to provide higher quality services for the general customers.